Bob Smith, a graduate of Peoria Central and Bradley, had one of the most successful and varied football coaching careers in local history. Starting at East Peoria High School in 1970, his teams went 18-12 for three years and he was named the 1972 Coach of the Year by his fellow Greater Peoria coaches. Switching to Peoria Manual, he posted a 44-9 record for five seasons (1973-1977), his 1975, 1976 and 1977 teams going unbeaten before losing in the state playoffs. In 1976 he was named a national coach of the year by Who’s Who. He was an assistant coach at Illinois between 1978 and 1983 for Mike White, and in 1988 for John Mackovic. 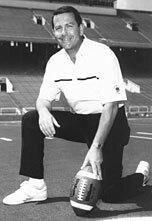 He coached in the 1982 Liberty Bowl, the 1983 Rose Bowl and the 1989 All-American Bowl. He was head coach at Southeast Missouri State in the 1984-87 seasons, going 21-19. His 1987 team won the Missouri Intercollegiate Athletic Association Conference and he was named the conference’s Coach of the Year. Smith was head coach at Southern Illinois between 1989 and 1994, going 19-32. His 1991 team was named the most improved team in the nation in Division 1-AA. His overall coaching record is 102-72.